Just before the Berlin GSM meeting the UK played host to one of the Working Parties of the GSM. It was customary in CEPT for the host administration to hold a dinner for the participants, usually towards the end of a one-week meeting. It was one of those rare idyllic English evenings. The day had been sunny but not oppressive. Entering the restaurant I bumped into one of the senior Italian delegates Mauro Sentinelli. He was a very warm and charming man and we exchanged pleasantries. He took me to one side and said that the Italian Minister was coming to London in a few weeks time. His Company had in mind to suggests to their Minister to encourage the UK to join the French/German/Italian digital cellular co-operation agreement. What was my view? I said that we would be delighted to join once the GSM had agreed objective criteria for evaluating the worth of the digital technology. He smiled. He understood my position perfectly. We agreed that his Minister would make the suggestion and I would brief my Minister to suggest that this would be possible if Italy could support the UK in getting the five criteria accepted. The next day I prepared a brief. It went into the machinery pulling together the DTI Minister’s briefing for the meeting with the Italian Minister. It made it clear that until the criteria were agreed in GSM we did not view it as timely to join the tri-partite agreement on digital cellular radio. The Italian Minister came. Exchanges took place according to the scripts we had prepared. There the matter rested. Life for Greg Faulkner and I was a juggling act, with so many international meetings to have to attend. I had no support staff and Greg’s team was thin on the ground. Two middle ranking officials had been lured away by higher salaries to British Telecom and Mercury. This only left two very junior staff manning the office when Greg and I were overseas at meetings – which was most of the time. In the autumn of 1985 a cabinet reshuffle took place. Leon Brittan arrived as Secretary of State at the DTI. Normally an incoming Minister would immerse himself in domestic issues before finding any time for international travel. What was unusual with Leon Brittan was that one of the first things he did was to make a quick courtesy call on Ministers in Germany. It caught us on the hop. Greg was abroad the week he arrived. So was I. Round came the commissioning notice to all DTI Divisions bearing a red immediate flag calling for briefing material to be submitted by the following day. No GSM mobile phones in those days. We were both out of contact. Greg’s two junior staff were in a flap. One of the few things of any international flavour they could lay their hands on was a copy of the brief I’d prepared many months earlier for the Italian Ministers visit to London. They did not understand its context. They blew the dust off and dutifully changed all references from Italy to Germany. This was sent forward to our embassy in Bonn. The embassy staff in Bonn were in a quandary of a different kind. The agenda between the German PTT Minister Dr Schwartz Schilling and Mr Brittan looked very sparse. Not surprising since on de-regulation the UK and Germany, at that time, were at opposite poles. The only item which seemed remotely positive was some obscure matter on pan European digital cellular radio. Even this appeared very half hearted with my strong caveats about the five criteria being first agreed in the GSM. Contact with London was useless. Anyone who knew anything was away. The meeting looked on the cards to be a potential embarrassment. There was nothing else for it. The man on the spot had to take a decision in the best interest of Anglo-German relations. Out of the brief went all the qualifications about the 5 criteria. It still looked a bit half hearted……maybe just a little more enthusiasm…! When I got back to my office I read the Foreign Office reporting telegram with mounting disbelief. The impression came across of Mr Brittan hurtling into the German PTT Ministers office, pumping his hand as he immediately enthused – “We’d just love to join your digital cellular co-operation agreement”. The German Minister and his officials were caught completely off-guard. My caution in GSM was widely interpreted as negativity. Ministry Officials had been fed a diet from their representative on the GSM of this negative attitude of the UK towards the Franco-German initiative. Dr Schwartz-Schilling mused out loud that a European system stretching from Milan to London was a very nice vision for Europe. He caught the moment. To the surprise of his officials he agreed on the spot that the UK should join and told them to look into it. That afternoon I was telephoned by a German official who broadly confirmed the picture painted in the UK Foreign Office reporting telegram. He said how surprised they had been by Mr Brittain’s proposal. He was not the only one who was surprised. I had not anticipated getting propelled forward quite so quickly or quite in this way. It was not clear why Germany or France would want us in the agreement and for this reason had envisaged a first approach to the Italians as a follow-up to their overtures. It was my turn to seize the moment. We discussed the mechanics of the UK joining the agreement. This involved preparing an Annex covering our entry. This needed to be sent to all existing parties for signature. He suggested that since the chances of getting the four Ministers in one place were negligible multiple copies needed to be prepared. These should then be orchestrated in a sort of postal dance. At the end of the dance all parties would finish up with four originals signed by all four Ministers. This sounded very complicated. My alternative proposal was to make one copy and circulate it around. The last one would make copies for the other three. There was a taking of breath at the far end. But he went along with the idea. There was another reason for doing things this way. Germany and Italy would sign the new agreement. But relations with France were at a low ebb following the snub British Telecom had shown the French PTT over the purchase of a second source of telephone exchanges. If the new agreement arrived at France last the other two could then put some pressure on them to sign…if they proved to be difficult. I had no comprehension just how difficult France would turn out to be. As a matter of normal procedure a copy of the new annex was sent to the DTI solicitors. A few days later a note came back, not objecting to the new annex, but the original agreement between the French, Germans and Italians. The DTI solicitor doubted that it would be acceptable to the EU competition authorities. She advised that the DTI shouldn’t sign. I phoned her up. It was not really up to the new boy to the club to say that we wanted to join but we wanted the others to first change the club rules. We were in no position to dictate terms. “Could she not give a professional judgement of the likelihood of risks of any European Court action ?” The solicitor stuck to her guns. She said she knew the Brussels competition authorities were itching to have a go at the monopoly national telecommunications authorities. She couldn’t recommend that the slightest risk was taken. This was getting things completely out of proportion. A note went up to the Junior Minister Mr Butcher fairly setting out the pros and con but recommending he ignore the solicitors advise and sign the new agreement. It came back signed. It passed through Germany quickly then languished in Italy for a while. That is nothing unusual. I happened to be in Italy in May 1985 visiting STET to discuss co-operation on a broadband switch project which Plessey were interested in. It was an opportunity to raise the progress of the digital cellular co-operation agreement. The reaction of Mr Randi, a very senior STET executive, took me a little aback. He was sceptical about the GSM project. Italy couldn’t wait. It needed to satisfy its market now with an analogue system. This was one of a number of indications of the market pressure tearing away at the pan European cellular radio initiative. The markets of the cellular radio operators were essentially out of phase. It was clear from Mr Randi’s remarks that Italy would not wait for the digital cellular radio system and were likely to dash to install an analogue cellular network. Shortly afterwards our annex to the digital cellular co-operation agreement arrived signed by STET and the Italian Ministry. It was signed by a DTI Minister and duly passed onto France. There followed a complete silence and I knew this had nothing to do with bureaucratic inefficiency – the French PTT were a very efficient administration. In July 1986 my diplomatic colleague Greg Faulkner and I flew to Odense in Denmark, the birthplace of Hans Christian Andersen. It was the meeting of the CEPT Telecommunications Commission, the management level overseeing the whole of CEPT’s telecommunications activities. One of the main agenda items was the new Memorandum of Understanding on terminal equipment type approval. I had been largely responsible for writing this MoU. A second UK objective in Odense was to press the French as to why they were holding back from signing the digital cellular radio co-operation agreement. The two were to become politically entangled as a result of an inspiration from Greg Faulkner. GSM was not the only thing on my plate over the previous 12 months. A lot of work had gone into this terminal equipment “type approval”. “Type approval” is used for equipment that has to meet Government regulations. Testing every product coming off a production line would be expensive. So in most cases only one is tested. It is assumed to be representative of that “type” of equipment. All subsequent equipment of that “type” is then deemed to meet the regulation and therefore approved. Up to then the same testing was being repeated in every EU country adding to the cost and delays in getting new products to market. The aim of the agreement before the Odense meeting was common regulatory standards and one-stop testing for telephone terminals. What was quite out of the ordinary was why this was being discussed in CEPT at Odense and not in the EU in Brussels. In fact in 1985 the EC Commission had tabled a draft directive that would give them new powers in proposing which regulatory standards should be used for telephone equipment type approval. A committee of Member States, voting by qualified majority, would take the final decision. This seemed fine to me. It moved us forward on market opening – a stated priority of the UK Government as part of the Single Market project. It was therefore somewhat surprising to receive a stiff note from the DTI division responsible for “standards”. The note accused me of conceding sovereignty to Brussels in the standards area. This was not something the Secretary of State, Norman Tebbit, wanted. I couldn’t believe it – I was being hauled before the Secretary of State for something so close to the Government’s heart – “market liberalisation”. (Note: The legal background was that once a new regulation is agreed in the EU then competence, or sovereignty as it has become known as, moved away from national governments and over to the EU). It all sounded pretty compelling to me. I went into the meeting feeling confident. Half an hour later I found myself outside the Secretary of State’s office in a daze. Norman Tebbit and Mrs Thatcher had just come back from the EU Council in Rome fuming. Their anger was in part against their EU partners but they were even more peeved with our own Foreign Office. “They would sell us down the river for asbestos mines in Greece” was the colourful expression I recall being used to describe our Foreign Office’s behaviour in Rome as Normal Tebbet viewed it. Mr Tebbit asked me who led for the UK in CEPT – answer the DTI. Second question – who led for the UK in the EU – answer the Foreign Office. He then made his a decision. Market opening in the rest of Europe was desirable but not if it involved losing any UK freedom of action. Things were to be kept as far away from the Foreign Office as possible. My instructions were that he wanted the type approval liberalisation but the job had to be done entirely by CEPT. I threw in my last card – but what about the advantage the EU gave for “weighted” voting. His response floored me. He wanted weighted voting in CEPT as well ! Getting weighted voting in a tradition bound organisation like CEPT? I had shot myself in the foot and was now landed with solving that problem as well. It took over a year to work my way around the problems set by Norman Tebbit. Fortunately we were not the only country, at that stage of the EU’s history, trying to keep things far away from Brussels as possible. But their motives were quite different. My new allies were governments that had more in mind holding onto their national powers to protect their industries from Far East imports. Politics makes strange bed fellows. The proposal we put forward to our European colleagues in CEPT was a complex structure that had CEPT making the standards in their traditional way, a new structure of Administrations under a memorandum of understanding adopting the standards by weighted majority voting and an EC directive then automatically giving the result legal force in the EU. The result of all this work was to be presented to the CEPT Telecommunications Commission for their approval. Then the EU Commission had reluctantly agreed to table the corresponding Directive that gave the arrangement its legal basis. The memorandum of understanding required a new committee to be set up (called TRAC). A Chairman had to be elected. Having been one of the principle architects of the MOU I was the front running candidate for the post. In spite of this (or even because of this) the French put up a rival candidate. After all the hard work I really felt entitled to this modest first step on the ladder to some elected position in European standards making. As the Telecommunications Commission meeting progressed it was evident that there was quite solid support for me to chair this new type approval standards committee. The French candidate wasn’t going to make it. The French delegation was decidedly evasive when Greg questioned them on the progress on France signing the digital cellular radio agreement that would allow the UK to join. Greg took me to one side during a coffee break. Why didn’t we do a trade with the French? I should withdraw my candidacy to allow their man to become Chairman of this new type approval standards committee and in return they would sign the new digital cellular co-operation agreement to allow the UK to join. I was stunned. He went on to quietly put the choice back in my lap, like the good Foreign Office diplomat he was. “You need to decide what you really want” he said “Is getting the UK into this digital cellular radio agreement more important?” We might be in the birth place of Hans Christian Andersen but I felt sure this was not a script he would have written. I reflected as my coffee went cold. The government was shifting Ministers at the DTI around like a game of musical chairs. Norman Tebbit had left the DTI. So had his successor Leon Brittan. Mr Channon was now the Secretary of State at the DTI. When I had put up to Mr Channon the result of my new MoU I had expected at least a “well done”. It was the only time in the history of the EU that the EU had ceded its legal powers to an outside entity, let alone an informal one. Instead I got a bland “the Secretary of State has noted your submission”. It was not evident either that we had a vibrant terminal equipment industry thrusting to get into the European market. They were more concerned that we had unilaterally opened our market and they were getting beaten up by cheap Far East imports. The Governments thrust for opening the European terminal equipment market was largely ideological. As Mr Tebbit had shown, this was not at any price. On the other hand there were now real efforts being made by the UK operators and industry for digital cellular radio. I knew that British Telecom were really keen to get into the agreement. Vodafone was warming to GSM. It was also getting tougher and tougher running against the pre-coordinated views of France/Germany and Italy at GSM meetings. The priority had to be to get inside and influence events as Alastair Macdonald had put to me a year earlier. Within a few moments my dream of a minor European chairmanship evaporated before my eyes. I gave Greg Faulkner the go ahead to negotiate. The French could hardly believe their luck. A reference back to Paris produced an additional demand that British Telecom agree to set up a joint group to study running a joint aeronautical telephone system. British Telecom was contacted in London. The deal was struck. A letter from Sir George Jefferson was faxed to the French PTT Director-General in Paris. To the disbelief of all the other CEPT delegations my name was withdrawn as a candidate for Chairman and offered for the Vice Chairman’s position (all the work and none of the power). The UK now supported the French candidate. Before we left Odense we checked with the head of the French delegation that the digital cellular radio cooperation agreement had been signed. He assured us that it had gone up to the Director General and been signed. On my way down to my holidays in the South of France, where my wife Jocelyne’s family lived, I called in to see the new French Chairman of the Type Approval Standards Committee appointed in Odense. He knew that initially he had to lean heavily on my expertise. I readily gave him that support. A deal is a deal. Just before I left his office I telephoned Philippe Dupuis. It had been a month now. We had seen no sign of our copy of the digital cellular radio co-operation agreement. Renzo Failli had told us that the next meeting under the agreement was in Rome that September. I asked Philippe when we could expect to receive a copy of the signed agreement. There was a long embarrassed silence. “I’m not quite sure how to tell you this” said a hesitant Philippe Dupuis “But the agreement has not been signed. It was put before the French PTT Director General as we’d been told. However he had refused to sign it. He wanted to wring some more concessions out of British Telecom before agreeing to sign it”. He was genuinely embarrassed. I was mortified. I phoned Greg Faulkner. He was as mortified as I was. We kicked it around. We had showed our cards and the French were raising the stakes. We could hardly reclaim the foregone chairmanship now. We baulked at pressing BT to give more concessions. An agreement is an agreement. It was a game of poker and we had to raise the stakes. We would tell the world that the French had signed the agreement and simply roll up to the next meeting in Rome and see what happened. After all the head of the French delegation to the Telecommunications Commission had told us that the agreement had been signed. Who were we to think anything to the contrary? Let the French do the explaining. It was agreed that he would send immediately an effusive telegram to the Germans, Italians and French expressing delight that everybody had now signed and that we looked forward to seeing our new partners in Rome. I went onto my holiday gritting my teeth. I duly arrived in Rome together with a representative from Cellnet and Vodafone. I could feel the tension in the air. I gave a flowery speech thanking all my colleagues for their efforts to make this tripartite co-operation into a quadripartite co-operation. The UK would do its best to play its full and constructive part. All eyes turned to Philippe Dupuis. To everybody’s amazement he smiled and welcomed us to the agreement and apologised for the papers having been “mislaid” by the French PTT. The temperature in the room nose-dived. Renzo Failli was in the chair and was at a loss what to do next. He had not expected matters to be resolved so rapidly. He filled the vacuum by spending the next thirty minutes on how to number the papers now there were four parties to the agreement. At the end of the two day meeting it was customary to sort out where the next meeting would be held. I came in like a flash. London was offered to cement our “new” status as full members. In January 1987 Mr Pattie the Minister for Information Technology was visiting Paris to pay a courtesy call on the French PTT Minister M Longuet. I’d prepared the brief for him on GSM. High on the list of things for him to say to the French Minister was “how pleased we were to be party to the digital cellular co-operation agreement”. The brief made the purpose of this loaded statement absolutely clear. Mr Pattie is one of life’s great ambassadors. He has wit, charm and presence. It wasn’t long before he was chatting to the French Minister like a long lost friend. In came the magic sentence about our presence in the digital cellular co-operation agreement. The conversation halted abruptly. The French Minister looked totally perplexed. He turned to M Grenier, one of his top officials and asked why he hadn’t been told of this. M. Grenier mumbled something about a very recent development. They hadn’t time to brief the Minister. The conversation moved on. I’m told that the next day M Grenier stalked into the Director General’s office with copies of the digital cellular co-operation agreement. He put it on his desk saying “The games-up “. The documents were signed. A week later Alastair Macdonald and my new chief Robert Priddle were in Paris visiting the French PTT. When Robert got back he sent me the signed agreement with a hand written note which said that they were handed to him by M Grenier “without so much as a blush”. I just sat at my desk and stared at the signed copies of the agreement for what seemed a very long time. Was it worth all the blood, toil, tears and sweat? It was later to prove critical to the whole European GSM project. When Germany, France, Italy and the UK move together – the world changes! But in September 1986 we were still some way off from moving together in the same direction. Britain entered its digital communications age through a series of European initiatives that linked government and industry in a huge transformation of Britain’s communications networks from analogue to digital. 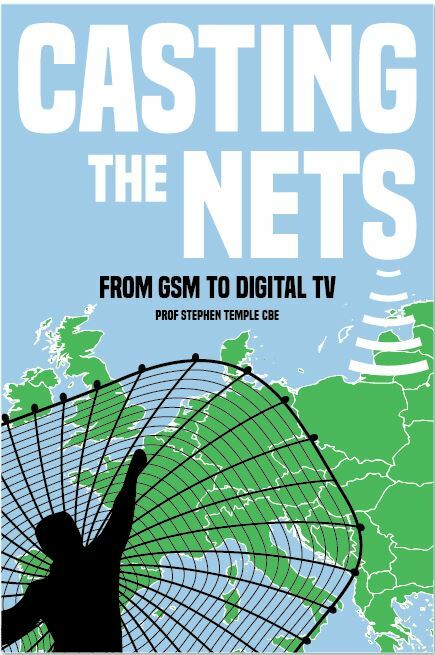 “Casting the Nets” provides an unparalleled insight into these initiatives. It provides powerful learning for policy makers and business leaders everywhere of how a country and a continent can bring to bear its political, corporate and intellectual power to create a world leading digital infrastructure. © 2019 GSM History: History of GSM, Mobile Networks, Vintage Mobiles, All rights reserved. Published by stephenTemple.co.uk.